18.5" x 12.5" x 6.5"
Grief is expressed by a mouth agape with despair, an unstoppable river of tears streaming down the cheeks, and the fixed gaze of eyes nearly swollen shut from mourning. 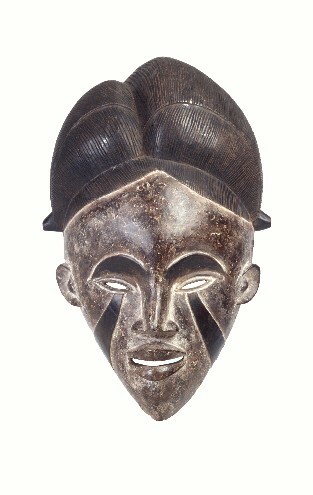 Once this memorial mask from Gabon was white, but now it is mottled brown and appears worn from use. The white pigment was made from kaolin found in riverbeds. Kaolin is associated with the spiritual and ancestral realm of existence. In Gabon, the Punu culture is especially known for its soulful face masks, whose noble grace often has been compared to Japanese Noh theater masks. Indeed, to see one of these masks in a ceremony, called a mukudj dance, would be a theatrical event since its wearer would rise high above the crowd dancing on stilts. Bibliography:Greub, 1988, p.36, 190; Hahner-Herzog, 1998, p.75, Metropolitan Museum of Art, 2002, ob.2000.177.